Dearal Rodgers is a professional angler who has competed in FLW Tour, FLW Series, and BFL events throughout the southeast. 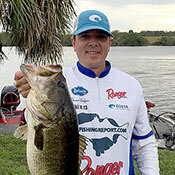 Dearal's accomplishments include a "Forrest Wood Cup" win as a Coangler in 2010, an FLW Tour "Coangler of the Year" title in 2009, and he has recently qualified for the BFL "All American" as a boater to be held in June of 2016. Dearal also enjoys sharing his faith and has enjoyed the opportunity to recount his testimony to many anglers, church groups, and sports events throughout the country. Dearal and his wife, April, also own Elite Techniques, Inc. (www.elitetechniquesinc.com), a successful environmental, geotechnical, and water well drilling business operating in numerous states throughout the southeast. Dearal also has two children, Sara (9) and Fisher (12) Rodgers. Dearal's proudest moment, "The year I traveled with Clay Dyer on the FLW Tour" (Clay is an inspirational disabled professional angler, www.claydyer.net). Traveling with Clay helped Dearal overcome his own physical challenges when an accident in 2013 left him with a broken hip and a severely broken right wrist. Dearal is feeling much better these days and is quickly working his way back to the professional ranks of the FLW Tour. His current sponsors along with Buckeye Lures include SCFishingReport.com, Ranger Boats, and Evinrude ETEC. Contact Dearal for speaking engagements through his website www.dearalrodgers.com.